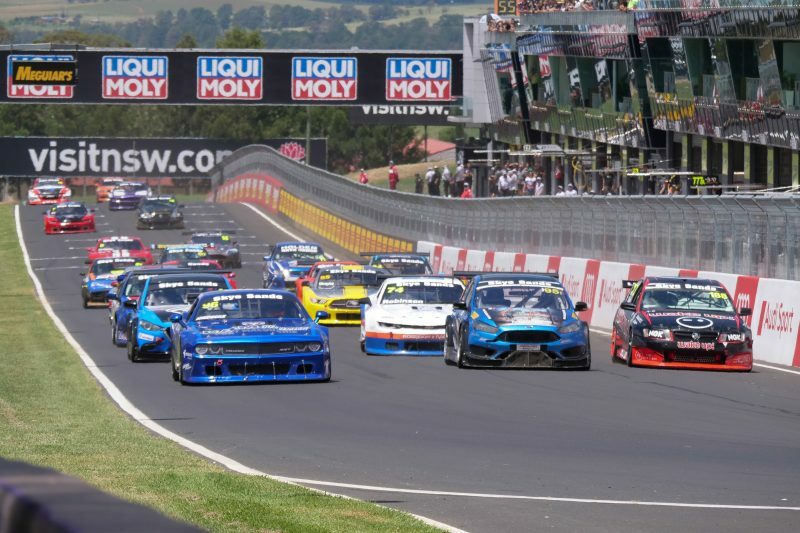 Dodge Challenger drew first blood on the opening day of on-track activity for the TA2 Muscle Car Series in 2019, as George Miedecke lead the TA2 field and sat second outright in the Skye Sands Combined Sedans support races at the Bathurst 12 Hour. The former Super 2, V8 Ute and Australian GT racer lowered the TA2 benchmark around the 6.12km Mount Panorama circuit to a 2:16.3640, three seconds quicker than the previous year’s best set by two-time American TA2 champion Gar Robinson. The Texan driver qualified in sixth with a 2:19.7, while 2017 champion Russell Wright scored a top ten start in ninth. Outright category pole-sitter Steven Lacey failed to take the start in his Camaro Sports Sedan, leaving Miedecke to start the opening race from pole position, ahead of Geoff Taunton’s MARC car. Miedecke battled through lapped traffic to take the chequered flag in second, as Robinson moved up two spots to fourth, while McAlister Motors driver Hugh McAlister climbed from 12th to sixth place. Chevrolet Camaro racer Michael Kulig rose nine positions to 11th, as Ian McAlister and Peter Robinson followed in 12th and 13th respectively after a great battle in the mid-pack. Rusty French, Cameron Sendall, Anthony Tenkate and Russell Wright secured top 20 positions, ahead of Greg Willis, Don Dimitriadis and Mark Crutcher rounding out the TA2 pack. Thursday’s top performer George Miedecke was pleased with his opening day performance while still chasing more from the Miedecke Motorsport Dodge Challenger. “Steve Lacey unfortunately didn’t take the start and I got to lead the first lap which was pretty cool, but I was a sitting duck when the quicker Sports Sedans made their way through the pack so I just focussed on my own race and it was great to get second,” said Miedecke. With track temperatures rising, Miedecke hopes the cooler weather forecasted in the following days will bring lap times down further. “I was absolutely cooking out there today, the soles in my race boots are starting to come off so it was definitely hot out there. The Skye Sands Combined Sedans field will take to the track at 8:05am on Friday for race two, and at 3:50pm on Saturday for the third and final race. Saturday’s race will be live streamed via the Bathurst 12 Hour website, www.bathurst12hour.com.au.